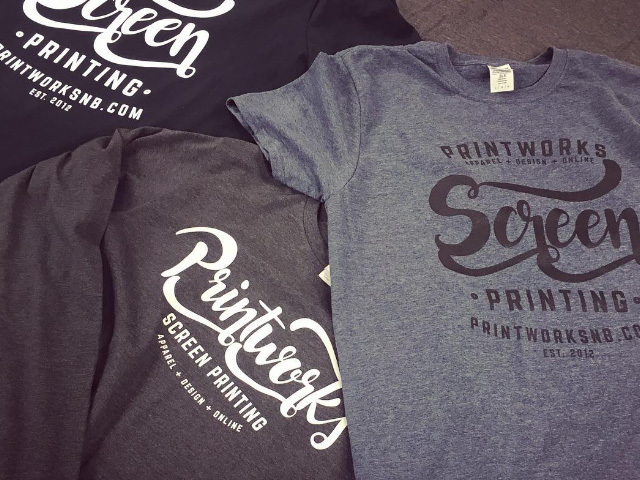 Printworks Screen Printing | Custom screen printed apparel. WE DESIGN AND PRINT AWESOME T-SHIRTS*. Printworks specializes in screen printed apparel and graphic design services. We also offer website design, custom vinyl graphics, and marketing consultation services. We are an experienced small team – responsive and ready to serve you, and we’re experts at what we do. Excellent service, great quality and turn around time as scheduled with no delays. Awesome first experience! Had several orders of shirts from these guys hassle free, and the finished product is excellent. Thank you for your fabulous and consistent customer service – LOVE being able to deal with someone local who we can depend on! Love the new sign, thanks guys you did an amazing job! Overwhelmed by how awesome all of our softball uniforms and clothing looks! Love dealing with Mike and Stephanie! If you need it done well and quickly use Printworks. They never fail to impress. These guys are amazing! Their work is second to none and the customer service is incredible. They are fast, accommodating, and beyond helpful. I recommend them to everyone.